Nynas Endura F1 is a highly modified Premium hot mix binder. The product has excellent workability characteristics and has been specially developed to deliver the optimum balance between toughness and flexibility. Nynas is playing a central part through the specialised binding agents it has developed over time. This year, Nynas has begun marketing a highly modified 'soft' bitumen product from its Performance Programme 'Premium' range called Nynas Endura F1. This binder opens up new possibilities in addressing reflective cracking. Laboratory assessments were first carried out to evaluate Endura F1's deformation properties. 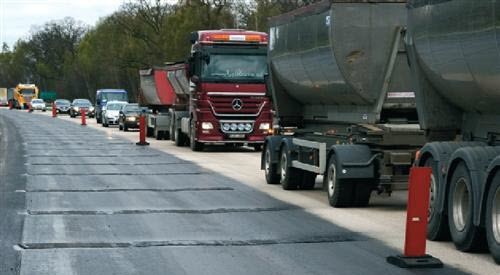 Then several successful trials were conducted during 2009 that compared the Nynas Premium product to a conventional polymer modified bitumen by applying both to older concrete roads. In order to widen the scope of the evaluation, a comparison was also made on sections of road that were flat face milled with glass fibre reinforced grid over the concrete joints; and then covered with a binder course plus a thin layer surfacing course. All in all, the tests confirm Endura F1's excellent properties. The new product combines the flexibility of the soft bitumen and the durability provided by the polymer modification and, thanks to the tailored mixture design the result is a highly flexible asphalt surface. During the summer of 2010, large scale surfacing work has been carried out at the Kropp Interchange, where E4 and E6 motorways converge. The client "Trafikverket" opted to use Nynas Endura F1 instead of rubber asphalt on one test section where the old concrete road was surfaced with a 40 mm thick asphalt layer. NCC Roads and the Swedish Transport Administration, which commissioned the work are counting on the Nynas Endura F1 to help the asphalt contain the movements in the underlying concrete road. With a conventional solution, there would have been a risk that the rigid asphalt would have cracked over the concrete joints, a process known as reflective cracking. However, there is overwhelming evidence that Endura F1 is more than just an effective alternative to replace older concrete roads with asphalt. Another potential area of use is smaller roads with widespread crack formation caused by, for instance, ageing surface courses. Download this information on how Nynas Endura F1 was used at E4 Motorway, Kropp interchange, Helsingborg, Sweden, as pdf.